Exhibit Services for all your exhibit needs. Choosing a company to store, maintain and manage your exhibit is as important as selecting a company to build it. Watch our team in action as we assemble your exhibit on-site. The fast-paced trade show industry is unforgiving. Mistakes discovered at the show are usually too late to correct. That’s why an organized and dedicated exhibit management provider is essential. L.A. Exhibits offers a state of the art exhibit management program to ensure that your exhibit is where you want it, when you need it and in the condition that you expect it in. Show Paperwork – we will handle as much or as little of your show forms as you want including accurate processing of shipping, materials handling, and any other show form that you may have. Complete Show Services – Service Order Completion / Supervision / Installation and Dismantle of display properties and services. With our experienced, professional, independent crews we get the job done right and fast, which saves you time and money – you simply show up and do business! Literature Distribution / Fulfillment – From simple distribution to complex processing of your product and or literature orders, LA Exhibits, Inc is your one stop source. We receive orders via the web, e-mail, hard copy, telephone and fax. We can customize a fulfillment ordering site linked to your present company web site for your global clients ease of order requests. Working in conjunction with your trade shows we can receive leads gathered at the end of each day of the show, process and ship literature or samples and have the package on the potential clients desk before they arrive back from the show allowing you a head start above your competitors. To meet your budgeting goals and get the discounted rates, all of your show services need to be ordered in time. Making travel arrangements, collateral & promotional campaigns and other client meeting events can lead to missed deadlines and costly overruns. We provide this professional service on your behalf with the knowledge to organize everything you need. From material handling, cleaning services to electrical and air orders and floor plans, we can cover it all! 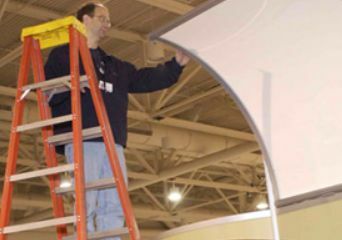 We travel to your event and have experienced crews to set up and dismantle your booth with many years of supervision to make sure your booth is completed on time and on budget! Why not let our dedicated team of show services professionals take care of this tedious portion of show preparation on your behalf so you can focus on showing up and do what you do best, represent your company! Bright Ideas, Even Brighter Solutions... All your tradeshow needs! From Idea to Concept, Design to Reality, we are the source for your marketing strategies.